Keep forgetting to post some pics of our veggie dinners. 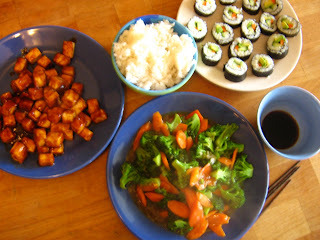 Here is one that we all really enjoy: hoisin tofu, stir fry, rice and sushi. This is one of the recipes that I like to use to introduce any tofu sceptic to tofu, all you do is dust it with cornstarch, fry it and then put a little hoisin sauce mixed with water onto it and stir to coat. Looks yummy, Heather. I was going to post a dinner picture yesterday but after 6 attempts I gave up. I think blogger must have been having problems. Anyway, it was a rather boring meal, what with being on this no-gluten, no-soy, no-bananas, etc etc etc diet. Yours looks much more appetizing. YUM!!! goodness, that looks delicious! You know I've read so many things about the evils of soy I just never buy it! Looks like it would be worth it for this one tho! thanks!